Thank you for introducing this artist and this beautiful piece. I was not familiar with either. 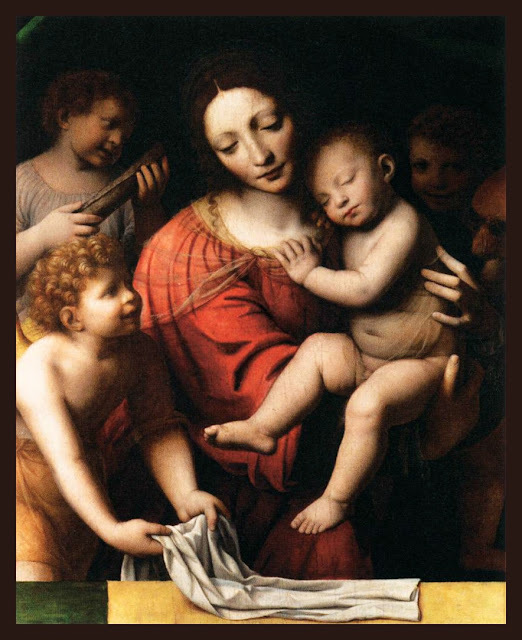 It is certainly kind of St John the Baptist to assist with Lord's diapering. I am quite sure that the Holy Mother appreciated the assistance. We do hear of the St John speaking as one not fit to unlace His sandals. St John never related the diapering tho. Ha! :) Wouldn't that have been so kind of John :)?!! The painting's title is "Madonna and Sleeping Child with Three Angels," so I'd assumed this helpful being to be one of those. I hadn't thought of the cloth as a diaper, but perhaps as swaddling clothes (??? ), and it made me think of the day when Jesus would be wrapped in a shroud. I wonder what the artist actually had in mind?